For use on potted and house plants, fruits, vegetables, ornamentals and shade trees. Derived from concentrated fish solubles that supply the natural release of essential nutrients for the development of green foliage, vigorous root systems and solid plant structure. 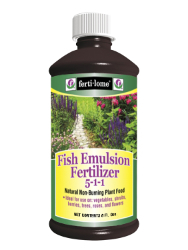 Shake well before applying 2 tbsp per gallon monthly during the growing and blooming season.